I am an introvert, through and through. I think that’s one reason I’m a writer. I’d rather communicate via email, letter, poem, story, or novel over actual personal interaction about 99% of the time. Because, well, PEOPLE. People wear me out. Don’t get me wrong. I don’t have a shy bone in my body. I am, however, very, very introverted. What I’m noticing is that I’ve now reached the part of publishing a book where I have to go out and greet people. And talk about the book. And smile. And, oh lordy, these sillies want me to SIGN MY BOOK!. Me! That’s practically an autograph! It’s too much attention. I very much dislike being the center of attention, and it’s uncomfortable for me. I’d as soon the earth open up and just swallow me whole. 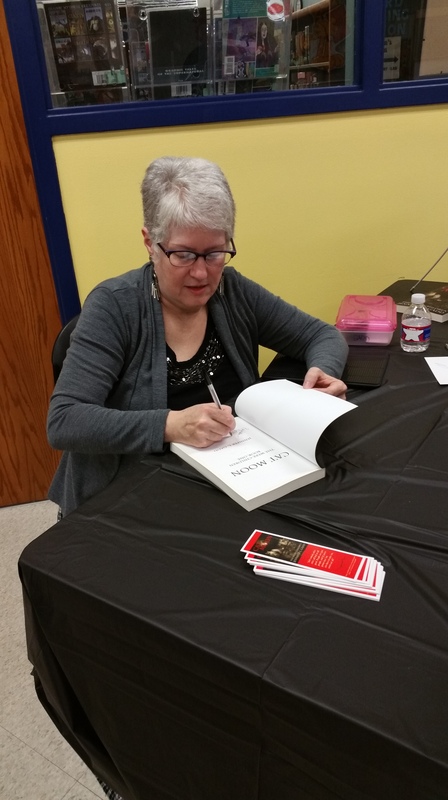 I had a lovely little author event last evening at my own personal public library, the West Wyandotte branch of the Kansas City, Kansas, Public Library. I did some of the writing and researching for the book in that library, so when I thought about an author event, that’s where I wanted to go first. They loved the idea, and the YA librarians went out of their way to make it a good event. I had anticipated a schedule that involved a little talk on my part, a reading, and some Q&A, but folks seemed to be trickling in whenever they could make it, rather than showing up right at the start time. I was okay with this because it meant I could be more the host of an open house event, and it would be more informal. I could spend more face-to-face time with those who had showed up. It was going great with the old friends who had dropped by. We were chatting, about life, about the book, about lots of things. And then it happened. Someone suggested that I do a read-aloud from the book. Even though I had initially been prepped mentally for it, I had already let it go and decided it was all going a different direction. I have no doubt that I had my best deer-in-the-headlights look on for a while. Then I sat down and read a bit. It was fine, of course, but there was still that part of me that wanted to turn the spotlight OFF. How about I sit in an another room and read into a microphone? Or maybe phone it in? Anything just to get you to STOP LOOKING AT ME. And these were my friends there! The thing is, a big part of indie and self-publishing is the promotion. Authors have to get out there and publicize themselves because there isn’t a high-powered, well-financed PR department doing it for them. I can get all that without relishing it particularly. I’m not sure I’ll ever be able to do it without being embarrassed, though. All in all, I’d just as soon be writing. This entry was posted in Jennifer L. Gadd, New Releases, Paranormal, Young Adult and tagged distinguished press, YA on October 28, 2015 by Sarah. There are a couple of things that I don’t talk about much when I discuss my upcoming book Cat Moon, Book One of The Were-Children series. Maybe it’s because I don’t want to trot out my lack of success as an author. Maybe I don’t really want to admit that I turned 55 years old this past month. I’m not sure. So here I go. True confessions. The first is that I wrote it ten years ago. Ten years. An entire decade. My daughters were 11 and 17, just children, and now they are grown women living their own successful adult lives.I was teaching at a different school in a different district. The students who were sitting in my classroom then are grown and having their own children, some of whom are approaching school age themselves. I probably owe them an apology for having assigned so much Silent Sustained Reading so I could scribble furiously on a yellow legal pad by longhand. They know me better, though, than to think I will ever apologize for giving them time to read. But if they ever wondered what I was doing while they were reading, this was it. I was writing this book. It was a long, long time ago. The second is, I think, connected to the first. Author Stephen King once said he got “dozens” of rejection slips for his first published novel Carrie. I don’t know how many that actually is, but I do know that Mr. King has nothing on me. I have kept all of those rejection slips in a folder, even printing out the many that came via email. Some are from agents; others are from the few publishers who consider un-agented work. I’m pretty sure I could wallpaper my bathroom with them. That, of course, doesn’t count the ones for which I got no response whatsoever. Any author who has queried a novel will tell you that it is absolutely soul-crushing. Oh, most them are so sweetly polite they set your teeth on edge, and they tell you that your work is probably quite good. It’s just not right for them. They let you down easy like that, but inside, you know. You know they thought your manuscript was stinking up their office and that you better not be quitting your day job. You know. Then came the magical moment when I got a phone call from a reader at a publisher I will not name. (I will, however, tell you that this same publisher’s predecessor company was the original publisher of Henry David Thoreau’s Walden, a fact which absolutely delighted me.) The reader loved it and was passing it on to an editor. A few months later, she called back and said that editor was going to pass it on to another editor she thought better suited for it. A few more months passed, and yes, I got another rejection slip. She said it had some good points, but she just didn’t have the time for the work it would take to make it publication-ready. In other words, my manuscript was stinking up her office. I did not quit my day job. You know what, though? A few more years went by, and the industry started changing. I toyed with the idea of self-publishing, but it was so overwhelming to consider, I just never did much that direction. Technology also changed, and that I felt I had a better handle on. So at the end of 2014, I participated in one of the literary pitch events on Twitter. Distinguished Press “starred” my short pitch, requesting that I query. I queried, fully expecting another rejection slip. This time, though, that didn’t happen. They accepted the manuscript. They love the story. They believe in me as a writer. Here we are, just a few days after release. Shortly after release, my book–MY book–was in the Amazon Top 100 for three separate categories. For a brief, shining moment, I had higher book sales than the legendary C. S. Lewis. Unprecedented! Many, many thanks to Catrina for taking a chance on my work, to Karyn for the edits, to Vanessa for the gorgeous cover of my dreams, and to Kristina for getting the word out to folks that the book is there to be read. Now I just need to get cracking on the rewrites for the second book! This entry was posted in Fantasy, Jennifer L. Gadd, New Releases, Paranormal on July 27, 2015 by Sarah.